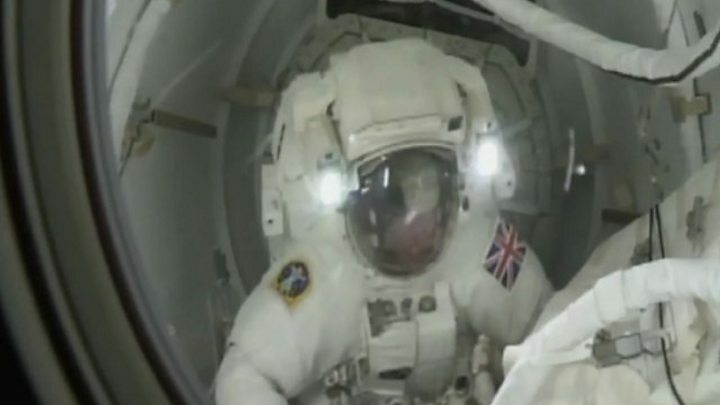 Tim Peake is carrying out the first ever spacewalk by an "official" British astronaut. Major Peake stepped outside the International Space Station's Quest airlock just after 13:00 GMT. He and Nasa astronaut Tim Kopra are scheduled to spend six-and-a-half hours on the exterior of the outpost. The astronauts have completed the primary goal of the spacewalk: replacing a faulty component on the station's exterior. Its failure in November last year compromised a power channel on the outpost. The failed electrical box regulates power from the solar panels. "I think a spacewalk is absolutely the pinnacle of an astronaut's career," Major Peake told BBC Stargazing Live this week. The European Space Agency (Esa) astronaut added: "We've put a huge amount of effort into this spacewalk. It's hugely exciting and we're ready to go." Note: This tracker uses the time set on the device you are using to predict where the space station is. If your pc, tablet or mobile has the wrong time set then the graphic will not show the correct position. During the EVA - the technical term for a spacewalk - the two Tims ventured to the very edge of the space station. They had to travel half its length, a distance of roughly 50m - which is equivalent to an Olympic-sized swimming pool. Peake and Kopra moved along the exterior using their arms, but are attached to the space station's external structure via steel cords, or tethers. Colonel Kopra exited the Quest airlock first, followed by his British colleague a few minutes later. Kopra then proceeded to the worksite with a toolbox, where he anchored a foot restraint as an additional safety measure. The US astronaut then gave a "Go" signal for Major Peake to follow the Nasa astronaut, carrying the replacement electrical box. Media captionBritish astronaut Tim Peake starts his historic spacewalk and calls it a "proud moment"
While he was waiting for Col Kopra's signal, Tim Peake was able to get accustomed to being outside for the first time, including looking down on planet Earth. Luca Parmitano, an Italian Esa astronaut who conducted two spacewalks in 2013, told BBC Five Live: "It is unimaginable... there are no words to describe the feeling of seeing our planet from above through a visor - that's all that separates us from the view, a thin visor of plexiglass." "When language evolved, it described what we saw around us. Being on the space station, doing an EVA, walking outside is not something we have experienced [as a species]." Both astronauts have trained in a large indoor water tank called the Neutral Buoyancy Laboratory at Houston's Johnson Space Center. Nasa astronaut Michael López-Alegría, who holds the US record for cumulative spacewalking time, said the two Tims were well prepared, but added there were key differences between underwater training and a real EVA. "One is that translation [moving from one point to another] is quite a bit different without the viscosity of the water," he told BBC News. "This is especially true when [Major Peake] will be transporting relatively large masses (like the SSU) relatively long distances. This fact will change his centre of gravity and will affect the results of the inputs he makes with his hands and arms during translation." But he explained: "This kind of thing is 'all in a day's work' for a spacewalker. I'm very confident that the two Tims will complete their tasks with great skill, efficiently and, most importantly, safely." The failed electrical component - known as a Sequential Shunt Unit (SSU) - was relatively straightforward to swap out: it involved undoing just one bolt. But the ISS takes 90 minutes to orbit the Earth, so the astronauts experience 45 minutes of daylight followed by 45 minutes of total darkness. Peake and Kopra could only work on the SSU in darkness, because in daylight, there may be a current running through the box. 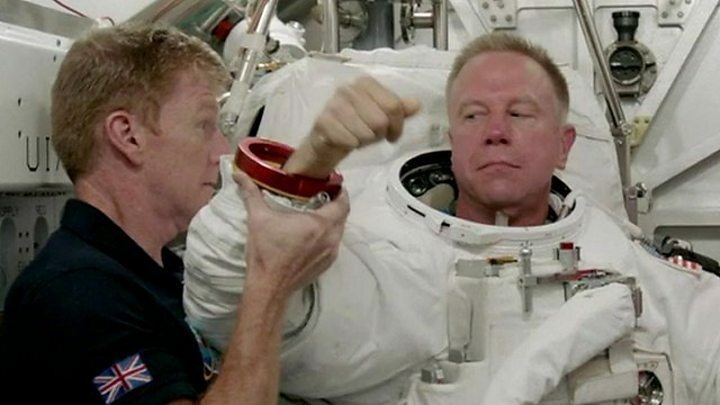 Tim Peake in space: Want to know more? Test yourself: Do you have what it takes to be an astronaut? Quiz: How dangerous is life in space? They were given a safe window of 31 minutes to work on changing the SSU, but only needed 19, finishing the task at 14:56 GMT. Speaking before the spacewalk, Mr Peake said both astronauts would have to be very careful while working on the electrical box because there was nothing to protect them from the high voltages generated by the solar panel. At one stage, Col Kopra's suit was showing abnormal CO2 readings, but mission control decided it was down to a sensor problem. The astronauts next split up to work on separate tasks. 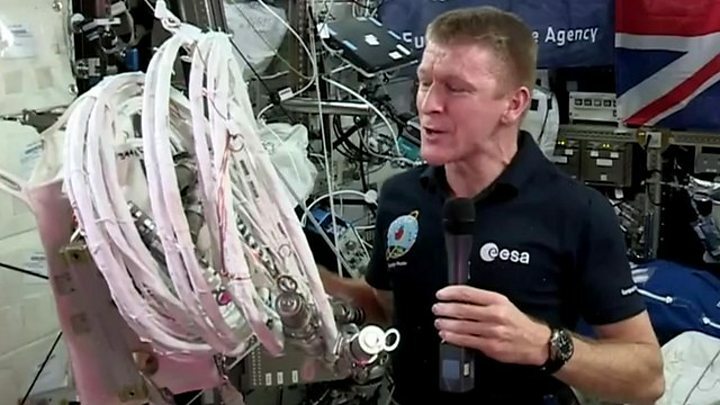 Tim Peake is deploying cables along one side of the station's Destiny lab; they are to be used by new docking ports. The task requires Major Peake to manoeuvre through some tight spaces, so he will have to be careful not to snag his tether on any components. Tim Kopra has several activities in the meantime; he has completed the installation of a valve that had to be removed for relocation of the station's Leonardo module last year. Michael Foale, who was born in Louth, Lincolnshire, became the first Briton to make a spacewalk on 9 February 1995, during a US space shuttle mission. Born to a British father and American mother, Mr Foale has dual British and US citizenship. He was selected under Nasa's astronaut programme and therefore "flew" as an American. Traditionally, the British government has not funded human spaceflight, leading a generation of budding astronauts to look to the US space agency as their only route to orbit. But the UK changed its policy after Mr Peake was selected in 2009 as a European Space Agency astronaut. Thus, Mr Peake is the first person since Helen Sharman in 1991 to wear the Union flag in space.